Wash the plums and leave whole. Heat a heavy based circular pastry dish. Add the sugar to the dish and melt, without stirring, to obtain a caramel. Add the butter, mix well and remove from the heat. Place the plums in the dish, on top of the caramel and leaving as little room as possible between the fruits. 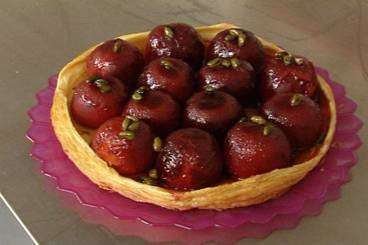 Sprinkle the pistachios over the plums and then cover with the pastry. Make a whole in the centre of the pastry to allow the water to evaporate as the plums cook. Bake the prunes at 200°C for 25 minutes. Remove from the oven and allow to rest for 15 minutes before turning onto a cooling rack. Scoop up the pistachios from the base of the baking dish and sprinkle over the dish. Serve immediately.